If you are like me, you probably spends hours of your free time combing Pinterest for your dream homes, kitchens, wedding you name it. Well in the past 5 years, I have moved seven times since arriving in California. Finally, just over two years ago, I settled into a home with my boyfriend. I guess you could say I immediately started “nesting”. First up on my agenda was to finally get some quality kitchen gear. I had been carting around the same old kitchen stuff I had in college. We are also fortunate enough to have wonderful pantry and cabinet space, which was mostly empty considering my boyfriend has lived in his condo for a few years. Once I started food blogging, I quickly filled them up! I bought large glass canisters to hold my flours and sugars and redid all the spices in small jars as well. I quickly learned that the jars I bought were not really convenient for all the baking I was doing. The lids had a small opening, so I couldn’t put any of my measuring cups directly in there. Instead, I had to use a scoop, and my hands would get dusty every time. 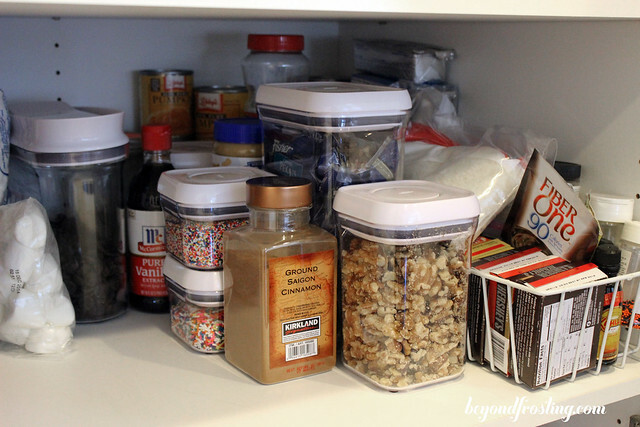 More recently, I have been wanting to redo my pantry again to find something more convenient. I discovered OXO Pop Containers and fell in love. I purchased a couple after having some problems with ants in my photo studio. Since I was carting food form the kitchen to the studio and getting crumbs all over, the ants would find their way in all the time. So I needed something to keep my food sealed. I loved how much stuff I could fit in there. When my hands are dirty, I just need one finger to POP open the lid. 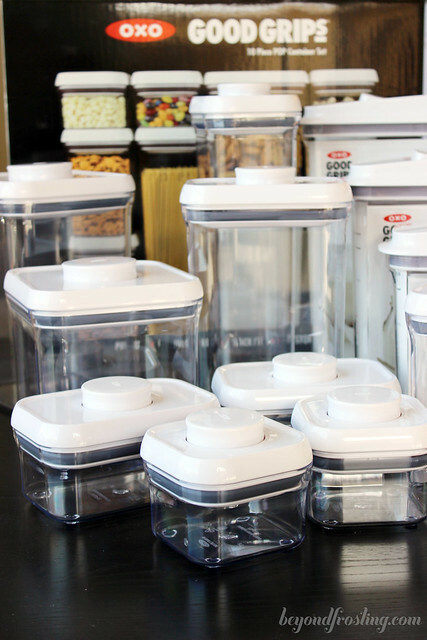 When OXO gave me the opportunity to receive their 10 piece set of POP Containers, I jumped at the chance! The POP Containers are ideal for storage. They are square or rectangle shaped to use up less space in your pantry, plus when sealed, they are flat on top, so it’s great for stacking. 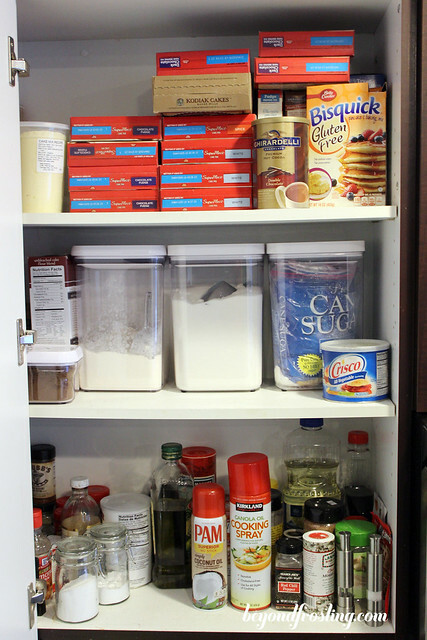 In my pantry, I have two shelves dedicated to just my blogging items. Anything on that shelf is off limits, but it is constantly messy since I just tend to shove bags of candy and boxes of graham crackers wherever there is room. I took advantage of this opportunity to sort things out a bit more. As you can see, I had quite a bit of bags to go through! I finally was able to transfer my sugar and flour in the large OXO containers. I baked the next day and it was SO much easier! I was also pleased because it hold a 10lb bag of sugar, so I don’t have to worry about storing the leftovers in a plastic bag. The large size is my favorite because I can also use it to store open bags of nuts, chocolate chips or whatever is laying around. We don’t eat a ton of cereal in our house, but I always have Rice Krispies on hand. 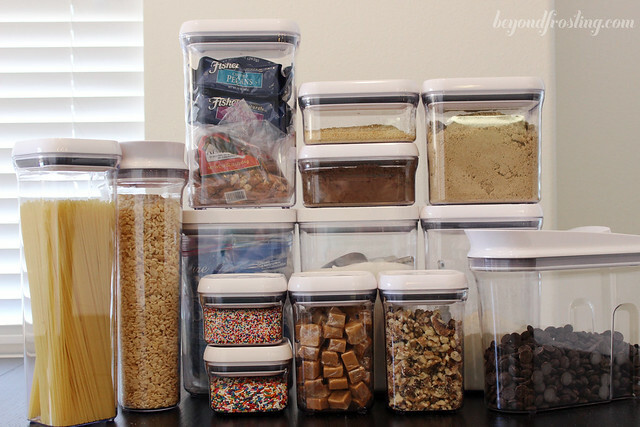 So I used the different cereal containers for my baking oats and large bags of chocolate chips. 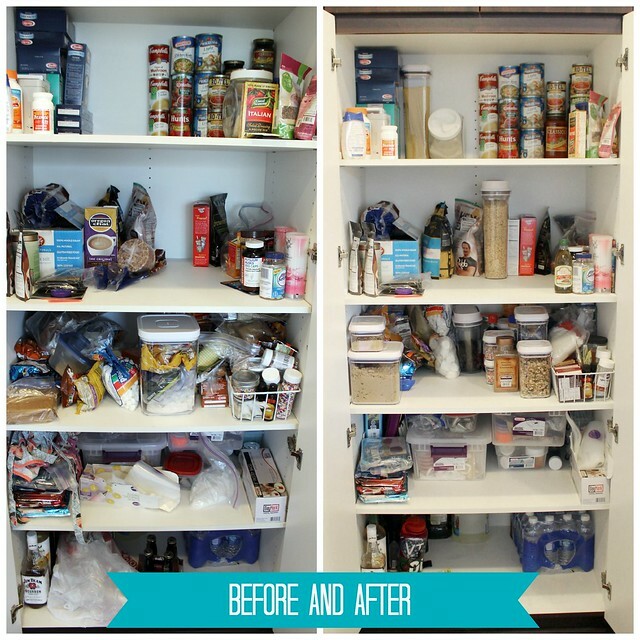 Some of the smaller containers helped eliminate more boxes and bags in my pantry as well. I used them for things like Cocoa powder, graham cracker crumbs, sprinkles, caramels and nuts. I was really excited to see it all neatly organized! 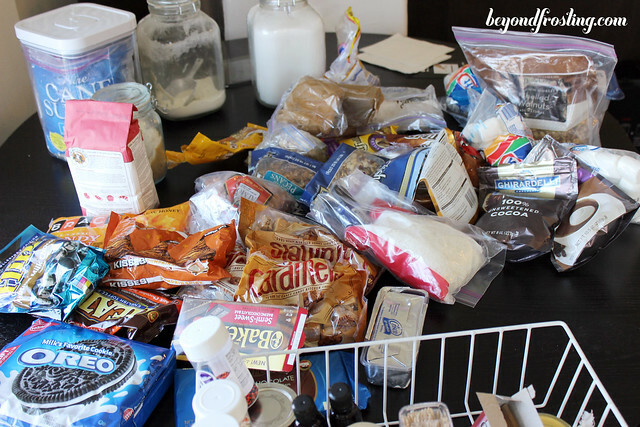 I know I am not the only one who wants an organized pantry right? Disclaimer: I received free product from OXO in order to review and organize my pantry. However, all opinions expressed in this post, as well as tips and advice are my own. I am making a 3 tier naked wedding cake and 100 cupcakes for a friend’s wedding in December and your easy instructions and recipes have been the answer to my prayers. Thank you so much, I feel a lot more confident after finding your site. This organization post just showed me how terribly organized my home currently is. I need to get my life together pronto. Julianne, I did the same thing today! 🙂 I should have posted a side by side photo. . love it!! 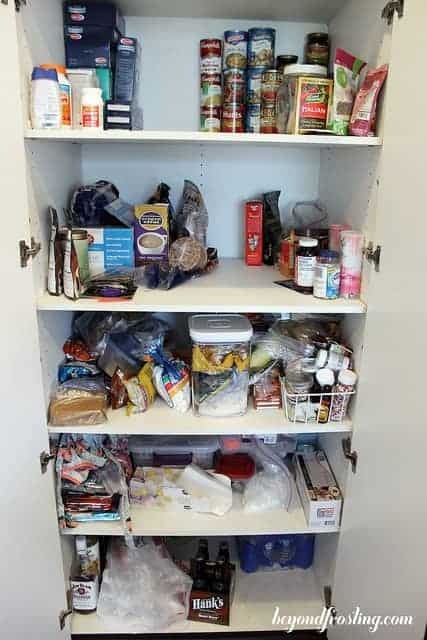 and love how much pantry space you have! now, I just need MORE POP containers! 😛 so great meeting you over the weekend. . hope you got home safely!